June 18, 2014—Ottawa, Ontario, Canada—Ottawa author Todd Coopee will visit Perfect Books in Ottawa for a special book signing and meet-the-author event, on Saturday, June 21. 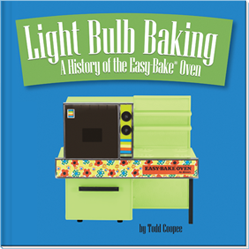 Coopee’s book, Light Bulb Baking: A History of the Easy-Bake® Oven, is the first definitive retrospective of the Easy-Bake® Oven. The award-winning book celebrates the toy’s journey from children’s toy to pop culture icon and inductee to The National Toy Hall of Fame. Perfect Books—a long-time supporter of independent writers and publishers—is hosting the event to pay homage to the Easy-Bake® Oven as a pop-culture icon and one of the world’s most successful toys. Todd Coopee can be booked for media interviews prior to and after the event. This first-ever definitive retrospective of the Easy-Bake® Oven celebrates its journey from children’s toy to pop culture icon and inductee to The National Toy Hall of Fame. The book explores the innovation, history, economics, commerce, advertising, and marketing behind the toy’s 50-year history. This book is a must-read for vintage toy collectors, nostalgia buffs, foodies, and anyone who has ever peered through the oven’s watch-it-bake window, eagerly anticipating the moment they will be able to serve and enjoy their very own culinary concoction. Todd Coopee is a toy historian and award-winning author. Through his writing and speaking, Todd takes audiences on a journey of celebration and appreciation of the objects that inspired curiosity, thought, experimentation, and wonder during the formative years of popular culture development in North America. Todd’s affinity for pop culture and toys led to his writing the celebrated 2013 retrospective, Light Bulb Baking: A History of the Easy-Bake® Oven, in honour of the iconic toy’s 50th birthday. The book garnered Todd two awards in 2013: Silver Independent Book Publishers Association (IBPA) Benjamin Franklin Award and Bronze Independent Publisher Book (IPPY) Award. Todd is an engaging speaker and writer with a focus on toys, nostalgia, and collecting. He writes the online series, Toy Tales, and is owner of Sonderho Press, a boutique publishing company. Todd lives in Ottawa, Ontario.